Celebrating its 40th anniversary, Europalia has embarked on a gargantuan task: welcoming giant China to Lilliputian Belgium. Beijing covers a geographic space that is roughly half the size of Belgium, and its city limits encompass about 14 million people. The entire population of Belgium is only 10 million. The official line from Belgium at the opening ceremony on October 8, 2009, emphasized Europalia's benefit for Belgium's economy,interests, and future. In contrast, Chinese vice-president, Xi Jinping, focused on the cultural platform that Europalia is giving China in Europe. 450 events, 50 exhibitions and 1,000 artists are focusing on four themes: Perennial China, Contemporary China, Colorful China, and China and the World. Visual arts, music, theater, cinema, dance and literature will blanket all Belgium until Chinese New Year's next February 14. Huang Yan, "Enchanting Paradise," a sculpture in "Chinese Gardens for Living"
But, this vast cultural extravaganza is not happening without criticism. At the press conference for the opening of "The State of Things," an exhibition on contemporary art from both China and Belgium which is one of Europalia's first events, Belgium journalists questioned the inflated prices for contemporary Chinese art, perceived Chinese imperialism, Tibet and human rights. Interestingly enough, nobody mentioned the Uighurs. A blog on the website of the newspaper Le Soir displayed a succession of comments ranging from the inflammatory to the nuanced. Some readers expressed shock at inviting China because of its history of human rights violations. There is a tendency by the broad public in the West to focus on classical China while failing to appreciate what is happening in contemporary China. One of Le Soir's bloggers asked why photos were included showing Mongols, the blogger obviously was not aware that Inner Mongolia is part of China.
" 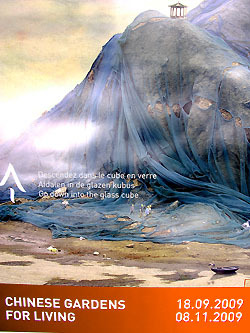 The State of Things: Brussels/Beijing" brings together 50 living artists from Belgium and China. This show's originality lies in its structure: two internationally renowned artists made the selection, working independently from each other. This is the first time a selection of Chinese art was done by a Chinese artist actually living in China for a major international exhibition on contemporary art. 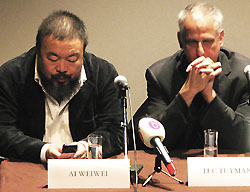 Ai Weiwei is one of China's most famous living artists. He helped conceptualize Beijing's Olympic Stadium, known as the Bird Nest. He is an outspoken artist, who was briefly arrested two months ago by the Chinese police for searching for the names of children who disappeared in the 2008 Sichuan earthquake. Luc Tuymans did the selection for Belgium. Luc Tuymans is considered as one of Belgium's leading contemporary artists, and his work has been shown internationally in the San Francisco Museum of Modern Art and The Tate Modern in London. themselves asking whether there was a juxtaposition. It is possible that the confrontation was exclusive and not inclusive as Luc Tuymans saw it. Conferences and lectures were also planned on the status and impact of the contemporary art market. In the last few years contemporary Chinese art has benefited from an enormous input of energy, mainly generated by the West. Most of the Belgian artists selected have not had that advantage. If on the Chinese side, it is difficult for the general public to decipher works without an explanation, on the Belgium side, the paintings are often so heavy that they are likely to lead to perplexity when they arrive in Beijing next summer. The two approaches are subjective. The catalogue describes the separate approaches as "mental navigations of two artists, curators for the occasion." Ai Weiwei is primarily interested in an opportunity to create an event that will take on its own life. Luc Tuymans wants to establish a momentum through which the event will build a dialogue afterwards. As he says somewhat cryptically, "The show is not in China now, but the show is already there." Though juxtaposition of artwork is one of the objectives of this exhibition, Chi Peng's work stands by itself in a room. For me, it is the most powerful and meaningful work in this exhibition. "Sprinting Forward-2" is reproduced everywhere as the flagship of the exhibition. For this artist, who is only 28 years old, sprinting forward is the epitome of young Chinese urbanites looking for independence, freedom, and a sense of themselves, which results from the one-child policy much as people once sought the American Dream. The perfect, youthful body of this young man, the artist himself, is a symbol of the freshness of a society trying to rebuild its principles. In this image as in much of his work, elements of technology are in motion that is in parallel to the contemporary world of knowledge, hopes and frustrations that continue to suffocate our destiny. But as a young artist, Chi Peng offers us his determination to escape into the future by using his naked body without any restraint. Some critics explain that the planes represent a sort of surveillance above a vulnerable youth. 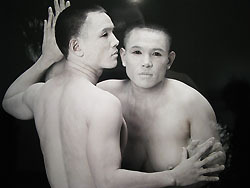 The beautiful photo entitled "Consubstantiality1," suggests a connection between the artist and homosexuality. The artist inhabits the tension of the photographic space by playing with a sexless figure. As Feng Boyi, a curator and commentator of Chi Peng, explains, "He (Chi Peng) begins his works with ego-cognition, from egovirtualization to ego-identity." Jan Fabre, "J'irai cracher sur vos tombes"
The title of Boris Vian's book, "J'irai cracher sur vos tombes," is the inspiration for the Belgian artist Jan Fabre's work, "I spit on my own Tomb," an installation done in 2007. It gruesomely welcomes the visitor with a life-size representation of a man standing in the middle of an accumulation of 250 gravestones. 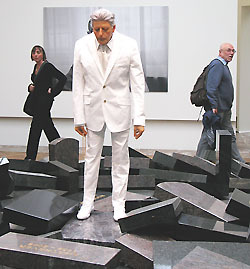 The man elegantly wears a white costume, and from time to time actually spits on the pile of dark granite stones. The inscriptions on the stones list names of living and extinct insects with dates of birth or birth and death of artists, philosophers, scientists...whose names are not inscribed on the stones. The references are given on a list that the visitor can consult. The search for the relationship between dates and names is irrelevant, even absurd, because it is the perpetual process of creative thinking that has to nourish us. Spitting on life and on death is a provocative act per se, but saliva is a body fluid like blood, sweat, sperm, and tears. A new life may emerge as the link between mind and body. Jan Fabre, who was born in Antwerp in 1958, is a multidisciplinary artist. 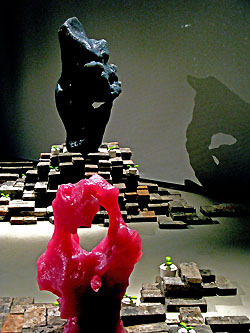 His installation "From Feet to Brain" was exhibited at the 2009 Biennale of Venice. Several interesting exhibitions and events are taking place at BOZAR, also known as Le Palais des Beaux-Arts (www.bozar.be or www.europalia.eu). "Son of Heaven," illustrates 5000 years of Chinese history with 250 masterpieces from various museums in the world. "Architecture as Resistance -Wang Shu/Amateur Architecture Studio" explores the new relationship between traditional architecture and new ways of life in China. "Still Life: Photographie Contemporaine Chinoise" leads us through the work of 13 young photographers. I would also recommend the screening of "My Village 2006," a film project undertaken by the filmmaker Wu Wenguang in collaboration with villagers who made their own films. This event will take place on November 15. A two-minute walk from BOZAR, at the former Palais des Congrès, in a new space called "Square," an exhibit, "Chinese Gardens for Living," brings us into the metaphorical world of contemplation by exploring the traditional components and philosophy behind the Chinese garden. The architectural display of the exhibition is composed of successive rows of semi-translucent curtains that form walls, which we have to pass through one after the other. The general ambience here is not the green of a garden, but off-white, subdued in a semi-obscurity, to facilitate our travel through our own subconscious. The exhibition includes photographs, sculptures, paintings and architectural projects. The curator, Tang Keyang, surprises the visitor. Instead of real grass, flowers, rocks, water, bricks, we have paper, canvas, iron, clay, plaster, silicone... Tang Keyang invites us to envision a garden as "a system which is still under development." Extracting the concept of the Chinese Garden, contemporary artists play with materials that do not belong to the physical garden. Traditionally, the components enter into a mutual dialogue based on the principle of Yin and Yang, complementary forces generated by the cosmic Dao. Four themes or dialogues are established by the curator: Illusions, Adored Objects, Drama, and Reality. Photographs and paintings belong to the world of illusion because reality is transferred to paper or canvas. Adored Objects reflects on tangible objects that can be transmuted in the sphere of a universal garden. Drama gives an opportunity for the artist to communicate with the world through the concept of garden and Reality focuses on architectural projects. Moving through the rows of translucent fabrics and semi-obscurity dedramatize the garden as a unique force. We are encouraged to reevaluate the energetic forces of the different elements of the garden and to reverse the process: going from detachment towards a density that we have to re-invent. It is thus a process from simplicity towards the global to which the artists invite us and leave us the choice of discovery or reinvention. 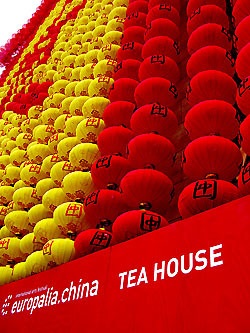 "Chinese Gardens for Living" (until November 8, 2009).